Frequently stricken with flooding, Community Medical Center’s outdoor break area was in need of an overhaul. The project site is located in a very flat grassed area, situated between a parking garage, and a large traditional parking lot. The proposed conditions included retrofitting the existing stormwater system to become a bioretention basin aimed at improving overall water quality while improving aesthetics. These improvements included removing an old inlet and providing native plantings in a low lying area to encourage infiltration. This basin retrofit project was designed to increase pollutant removal efficiency, enhance its aesthetics, and reduce total maintenance needs. Adjacent to the above bio-retention basin, additional improvements at Community Medical Center included removing the impervious patio area and gazebo, replaced with eco-pavers and benches, and creating a native plant garden. The pavers bring beauty and functionality to sustainable design, allowing rainwater to recharge to the ground, reducing stormwater runoff. These pavers are installed with spaces between them allowing for better drainage and water permeability. The native plant garden provides habitat and food for local species of pollinators and birds. When these native plants are used in a garden system, they act to remove harmful chemicals and excess nutrients from stormwater runoff before it infiltrates into the ground or makes its way to a stream or river. 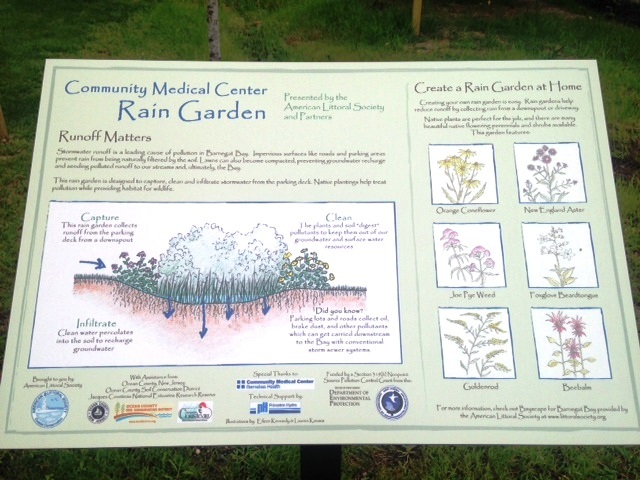 For an image of this gardens educational sign, please click "here". - Please click "Technical Publication" for details on stormwater improvements that can be implemented in your town. A Concerned Clean Water Advocate? - Please click "Clean Water Beautiful Bay" for a brochure on stormwater improvements that you can share with your local officals. - Please click "Basin Prioritization Matrix" to understand how to target the most crucial areas in a watershed for stormwater improvements.